Smartvue S9 Linux surveillance appliance servers offer plug and play installation with built in cloud services and support for up to 100 HD cameras at each location. The world's fastest, easiest cloud surveillance service is built into every Smartvue server. 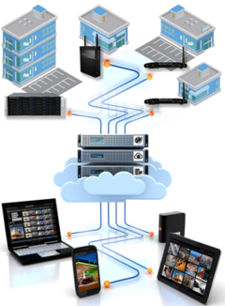 Cloudvue offers simple, secure, and FREE live and recorded video access for up to thousands of servers and cameras from a single website.